Pavlova. The word rolls off of your tongue, all at once light and alluring, heavenly and undeniably delicious. Pavlova. I decided to make it for three reasons. First, it looked gorgeous and I was curious to try it. Second, I wanted to make it chocolate and submit it to Poornima’s “For the Love of Chocolate” event. And finally, I was meeting my Grandma to celebrate her birthday and this seemed perfect. Like me, my mother had never heard of it before. “How do you spell it?” she asked. Pavlova is not entirely difficult. It’s a meringue base, with a thin crisp outer crust and a chewy, marshmallowy inside. The meringue nest is topped with freshly whipped cream and fresh fruit. The whole thing melts in your mouth, and the sweetness of the meringue is cut by the fruit and the cream, if unsweetened. So why did this little dessert give me such a hard time? Right off the bat, I broke 18 eggs. I was opening the fridge to take out the four eggs needed for the pavlovas. One moment, I was talking, with the four eggs in my hand. The next moment, my mother had pushed me all the way over to the cabinets in an attempt to stop me, but alas – the empty container slid guiltily on the floor and sacrificed every egg along the way. While my four egg whites came to room temperature, I wiped up the floor and tried to keep the dogs from licking the splattered raw yolk. But it was about to get much, much more embarrassing. The next screw up came while I was making the meringue. I was looking at two different recipes. One was Nigella Lawson’s recipe for mini pavlovas, the other was a recipe for chocolate pavlova. You see, I wanted Nigella’s cute little pavlovas but the chocolate of the other recipe. However, Nigella used vinegar in her pavlovas, and the second recipe used cream of tartar. Dumbly, I read the instructions for the chocolate pavlova, assuming the technique would be the same, and simply ignoring the part about cream of tartar. And that is how I forgot the vinegar, which is essential for keeping the pavlova characteristically chewy, into my egg whites. PLUS, I forgot I was halving Nigella’s recipe and therefore used twice the cornstarch. They did look pretty when I took them out of the oven. Very reluctantly, I picked the least attractive of the lot and took a tentative bite. To my relief, it tasted just like it should – crisp and crackly on the outside, soft and chewy within. I stored them in an airtight container. The next day, I planned to take them to my Grandma’s house for her birthday. Oh, no. The lack of vinegar, it seems, made my pavlova extra delicate. I had stacked them in the container and unintentionally crushed two of them. They still tasted good, though. I packed the three remaining pavlovas and the whipping cream into a bag, – but I’d forgotten the fruit – the raspberries, blueberries, and marionberries. When I started to assemble the pavlovas at Grandma’s house, I suddenly realized I had no topping. Did Grandma have any fresh fruit? Two little bananas. Well, chocolate and banana are classic, right? To add the cherry on top, I’d forgotten to charge my camera. So I had no photos of my Grandma’s pavlova. I had to set up these photos at home. Go me. I’ll say this – considering the number of times I slapped my forehead during the creation of these pavlovas, they were successful. Despite my meringue mistake, they were delicious. Grandma enjoyed the pavlovas as much as me. So it is with a big sigh of relief and just a little bit of satisfaction that I get to post not only pictures but a recipe. Try to be a little bit more on top of things than me, and enjoy! Whisk the egg whites with the salt in a clean bowl. I used an electric mixer. Start slow, then work your way up to medium, working the eggs until foamy with small, uniform bubbles. Add the sugar gradually, spoonful by spoonful, with the mixer on medium-high. Beat 5 minutes more, or until meringue is snowy and holds stiff peaks. Sprinkle the cornstarch, vanilla extract, vinegar, and cocoa powder on top and fold into the mixture with a rubber spatula. Line two baking sheets with parchment paper. Draw six 4 inch circles on the parchment paper, then flip it over. 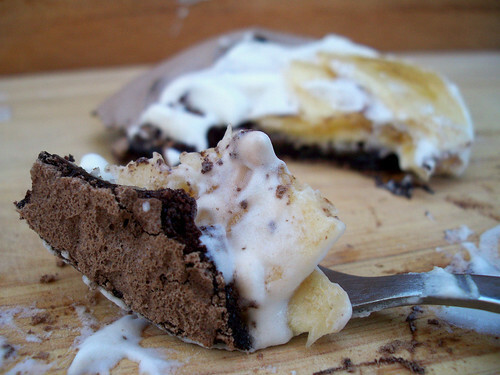 Use a spoon to spread the meringue onto the parchment paper, using the circles as a guide. Smooth the edges and use the back of the spoon to make a light indentation in the center, so the sides are slightly higher. Put the sheets in the oven and immediately turn the temperature down to 300 degrees. Bake 30 minutes, then turn the oven off and crack the door slightly ajar. Let the meringues cool in the oven another 30 minutes. To assemble, fill the meringues with the whipped cream (I prefer unsweetened, as the meringue is already sweet.) Peel the bananas and cut, at an angle, into thin slices. 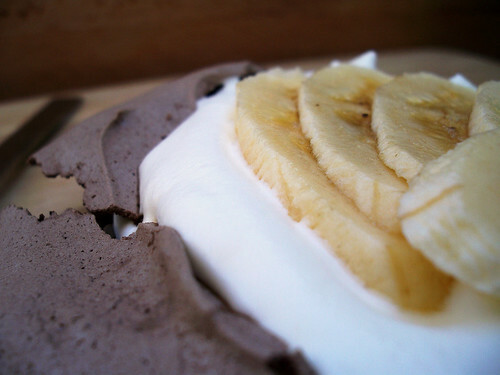 Decorate the top of the pavlova with the slices of banana (or any fresh fruit). Eat immediately, as the meringue will soften. Also, like I mentioned before – I am submitting this into Poornima’s “For the Love of Chocolate” event. Check it out – there’s going to be lots of tasty entries! Entry filed under: Other Treats. 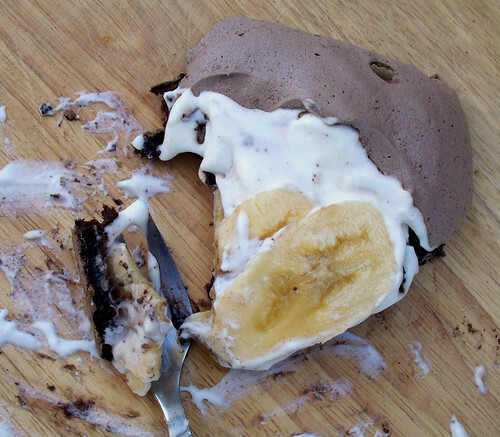 Tags: bananas, chocolate, disaster, gluten free, meringue. Haha… mixing recipes is the hardest! Like you, I never think it’s going to be a problem until I really mess things up. You know the best thing about changing recipes is that you get to eat the mistakes and crow about the successes. I bet they tasted wonderful. I just browsed past several of your posts. 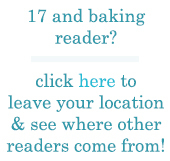 Your pictures and your baked goods look delightful, moist, perfect and delicious. I am faint with hunger now and have only a 1/2 box of Girl Scout cookies to snack on…. Keep up the amazing work and I’ll be checking back for more of your treats. Amanda – Very true :) I think I probably learn more from disasters than perfect executions anyways. Laurel – I agree, it’s definitely a risk worth taking! Muse Swings – Thank you! Thats another yummy dish…love the flavors in it…thanks for sending it over..
Glad they ended up turning out for you! I have that type of stuff happen to me too. It’s usually when I’m trying to mix different pieces of recipes as well and then changing measurements around. It happens to all of us! Nice job on the challenge, they look great! early in the dawn, since i enjoy to find out more and more. activity and our whole group will be thankful to you. your photo taken ‘spooning’ or with me lying my head on your chest. associated with the upper airway resistance syndrome. There is no additional requirement of separate NOx capturing devices which reduces capital investment. can’t wait to take a lokok whhen I get home. not even using WIFI, just 3G .. Anyways, superb site! Such clever work and reporting! Keep up the excellent works guys I’ve you guys to blogroll.